Lawrence .235" acrylic stock signs are available in two sizes: 7" x 11" or 11" x 14" in a wide variety of colors. These signs are for use with the 1700 and 1701 sign brackets (you must choose a sign bracket for mounting when ordering, see below). Signs include a stock silk screen imprint, or create your own custom message. 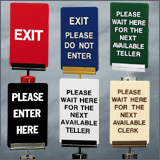 All signs available in a vertical (portrait) or horizontal (landscape) format.